LOTS of single link track parts (at least they are one piece and big!). In 1937, two critical figures were appointed to take charge of the Soviet tank industry production. Mikhail Koshkin was placed as chief designer at the Kharkov Steam Locomotive Plant No. 183 and Zhosef Kotin was given Kirov Tank Plant No. 185 in Leningrad. But in short order Kotin - whose wife was the goddaughter of Kliment Voroshilov, No. 3 man in the CPSU - was also given charge of Voroshilov Plant No. 174, OKMO (Experimental Design and Mechanical Section, later Plant No. 100), and supporting factories in the Leningrad area. One of Kotin’s first tasks was to work on the creation of a new “breakthrough” or heavy tank; these were defined as heavy tanks with “shell-proof” armor protection, machine guns to suppress infantry, antitank guns to destroy enemy tanks, and a big gun for destruction of emplacements, buildings, soft targets and other objects of interest. Previously they had created the T-35 heavy tank for this purpose, but it was a poor design and mechanically unreliable. After fumbling around with eight prospective versions of the T-39 heavy tank - none of which were built - Kotin tasked his two major design bureaus with coming up with a new tank. It was to have three turrets vice five (two antitank guns and a main gun turret), a powerful engine, and a new 5-speed transmission. SKB-1 (Plant No. 174) under S.A. Ginzberg came with the T-100, and SKB-2 (Plant No. 185) under N.V. Tseyts produced the SMK (For Sergei M. Kirov, the martyred Communist boss of Leningrad). Models of both tanks were produced and shown to Stalin on April 28 1938. 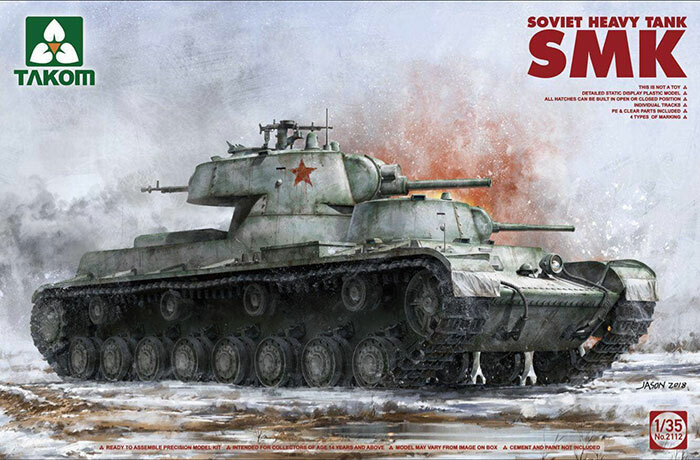 Stalin laughed and called them “department store tanks with a gun for every occasion”. He broke off a turret from the models and asked if Kotin could built it this way. He said yes and both tanks were then built as single prototypes. The SMK version showed up with a wealth of armament: a bow 7.62mm DT machine next to the driver; a 45mm 20-K gun and coaxial DT in the front turret; a 76mm L-11 gun, coaxial DT machine gun, and rearward firing 12.7mm DshK machine gun in the rear turret; and a DT machine gun on an antiaircraft mount and rotating ring. It also used torsion bar suspension and internally buffered medium diameter road wheels. Crew was listed as seven men. When war broke out with Finland in December 1939, both the T-100 and SMK were sent there along with two prototype KV tanks as a provisional heavy tank company. Performance was not good and eventually the SMK hit a mine, blowing off one track. The Soviets tried to recover it but even using three yoked T-28 medium tanks they were unable to pull the 55 metric ton tank to safety; it was stripped of all military equipment possible and abandoned. In the spring of 1940 the Soviets did recover the tank but it remained as an oddity and the last of their multiturreted monsters; the T-100 was rebuilt as a self-propelled 152mm gun. More than 30 years ago, as I was hitting my stride in scratchbuilding armor models, Bob Bethea pleaded with me to do the SMK as it was such a unique vehicle. But plans and information was scant in those days and I never got around to it. Happily - and surprisingly - Takom has now produced an excellent kit of the beast and at the very reasonable cost (these days!) of only US$50. They chose some rather unorthodox solutions to molding such a beast; the upper hull and side panels are slide molded with most details in place (it is 243mm long so not a small item). The belly, stern and bow plates all are separate items. Likewise the turrets are formed from multiple parts as well - the forward (45mm) turret has 14 parts and the rear (76mm) one has 33. Main moldings are split lengthwise with multipart races and skirts. Tracks are single link but at least they are one piece (e.g. non-working) and large. Construction starts with the upper hull and then proceeds to the installation of the bow and glacis plates. The single PE part, the radiator grille, is attached as well. This is followed by the belly and stern plates and rear air deflector components. In Steps 6 & 7 the road wheel arms are attached as well as the jounce stops and idler adjustments. The wheels - all 48 of them in total - go on next. The kit comes with 240 links but only 110 per side or 220 are needed for the track runs. Next are the fenders but as it was a prototype they are rather plain and unadorned. It has slide molded heads for the tow cables and twisted copper wire for the main section. These are shorter than the ones normally seen on later tank designs. Next is the 45mm turret which is correctly mounted offset to the left to provide room for the driver’s hatch; this is molded in place so no options, and ditto with the 45mm turret hatch. The rear turret is more involved and does permit the hatch to be open or closed so a commander figure could be fitted to the model. Four marking and finishing options are offered: Kubinka Test Grounds, August 1939 (overall 4BO green with red stars and white trim); 91st Tank Battalion, 20th Heavy Tank Brigade, Finnish War 1939-40 (overall 4BO green with whitewash applied on major panels); prospective three color Leningrad Front camouflage (light green/4BO green/brown with red stars and white outlines); and another proposed camouflage scheme (4BO green/black/khaki with red motto “Nashi Sily Neischiclimy!” or “Our forces are Innumerable!”). A small decal sheet is provided. Overall this is a great idea and a nice kit of an obscure detour in Soviet tank design. At least now Bob can get and build his own!